Case V-42 commemorative blade made in 1984 without handle or sheath. The Force Knife, V-42 stiletto or V-42 fighting knife. Case V-42 commemorative blade made in 1984 without handle or sheath. Overall length 11-3/4" by 3/16" thick at the back of the blade. The pommel is threaded. Tarnish is on both sides of the blade. Blade is not sharp and may have never been sharpened. Blade etched with "In honor of the Canadians of the First Special Service Force". Two knives were issued one with polished and one with blued blade. 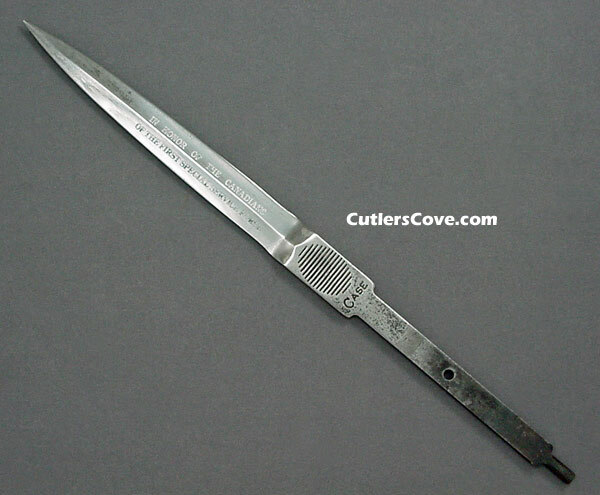 Reissue of the Case V42 dagger of WWII with thumb groove on blade. On the front side it is marked CASE and on the back side it is marked with the double arrows. I believe only 2,000 where made. May be a American Historical Foundation reproduction or the Case 1984 version not for sure. It would make a great stiletto if you are a do it yourself person.